I am Martha, and I’m from Mexico. 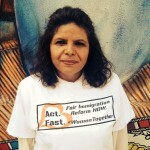 I have been coming to Mujeres Unidas y Activas for 3 years. I came here after I moved from Georgia to San Francisco, my sister works here and she always talked about the organization and all the great programs they have. I like the support and training I receive at MUA. I also like that we are free to express our feelings and anything we want. I learned coming to MUA that I am a leader. I want to continue working on being a better person and community leader with all the knowledge and skills MUA provides for me.